Yum! This was so much fun to make for my daughter's birthday party & I can't believe how good they were, too. We had these instead of a cake, and it was a big hit. 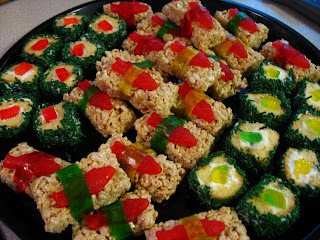 I made two styles of "sushi" - one was a [homemade] Rice Krispie Treat & Swedish Fish wrapped in a fruit leather, the other were 1/4 Twinkies, rolled in frosting and green sprinkles, then topped with a piece of a gummi worm. I had tons of green sprinkles left over from a St.Patrick's day cookie catering event a while ago, and I'm glad I found a use for some of them! Leftovers were packed up for the kids to take home, too. This was easier than making a cake, too, took about an hour I think, and lots less cleanup. Um...these look amazing. I don't have kids, but I'm still making these for my next party!